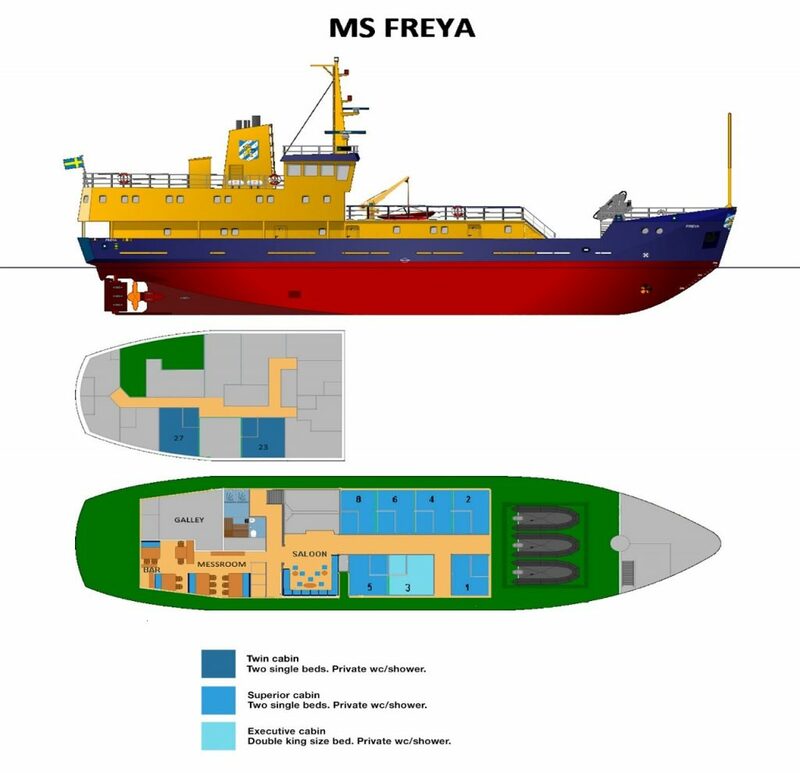 M/S Freya was originally built for the Swedish Maritime Administration in 1981. Since then the ship has also been used by the Swedish Coast Guard for research and science expeditions. In 2015 she was converted to an Arctic expedition ship, and came to Svalbard for the first time in the summer of 2016. During the last few years she has been completely renovated and rebuilt for expeditions like this one. Freya has capacity for up to 26 passengers in seven newly built twin cabins and four old, but renovated ones. All cabins have private toilets and showers. On this expedition we only bring 18 passengers, to make it as spacious and comfortable for everyone as possible. On the ship we have a spectacular deck with a 360 degree view, a large dining room for all our meals, a nice lounge and a cozy sauna where you can warm yourself after the day’s adventures. Traveling with only 18 passengers makes it feel more like being on a private yacht rather than a bigger expedition ship. We have a crew of eight people on board, everyone ready to assist and make the most out of our expedition.